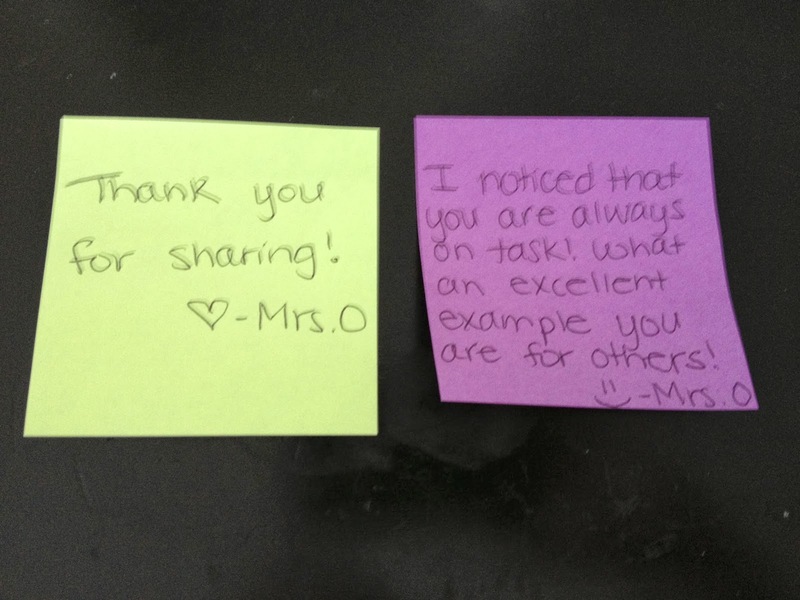 It's the little things that make our students happy, isn't it? 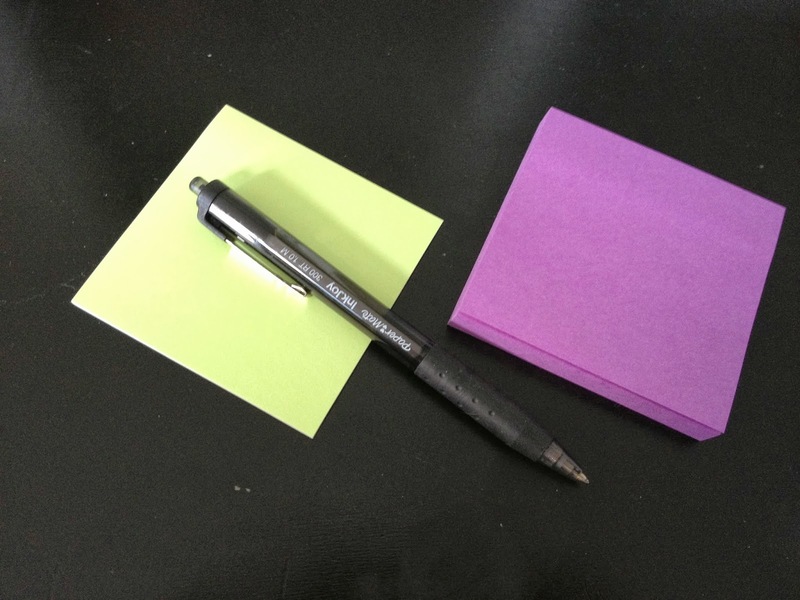 When I taught in Washington I was sitting in one of those "we're all so happy to be here" meetings and noticed that one teacher had a stack of post-it notes, and was filling out one after the other. Since I was engaged in learning easily distracted, I asked her what on Earth she was doing. She passed the notes my way. 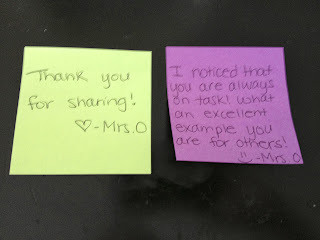 She was writing a note to each of her students to acknowledge something positive that they had done that day. She told me that she leaves them on their desks to find in the morning and some of them keep it on their desk day after day. I thought that this was a fantastic idea and began to implement it shortly after. Well, I must say, that it truly did make a difference to my students! It's funny that something so small could have such a positive impression on students, but I speak from experience when I say that it does. Now, I know what you are thinking, "When am I supposed to find the time to fill out sticky notes every day?" I don't do them every day. What I do is keep a pack of stickies on me. 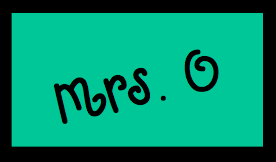 If I am walking around the classroom and notice that Johnny is doing a great job at __________, then I write the note as I am walking around the room and keep it with me until the students leave, then leave it on his desk to find the next morning. I don't leave one for every student every day, because I am afraid it wouldn't be as special anymore. I do keep a tally next to each student's name so that I'm sure that they are being equally distributed as well. I have one student who received two sticky notes in the first month and he proudly displays them on his desk. He's not the only one. It's amazing when little things make a big difference, isn't it? And hey, I think my colleague was on to something. Sit in the back of the room for those meetings that are less than the most fun you've ever had, and multi-task away! I hope that you aren't all as tired as I am at the end of a very long September. Wowzers! I think I'm really starting to feel my age these days! On that note, it's 11pm and Monday is just around the corner. Time to say goodbye for now, friends! Grab some sticky notes and make a child's day this week! You'll be glad you did! Back in July I had a fabulous Dollar Tree haul. I found these really adorable tote bags. When I saw them, I immediately knew what I would use them for. For nine years, my students have adored my extensive classroom library, which I try hard to keep stocked with books of interest each year. My first year of teaching, I let students take books home without any conditions. No extra sign out, no nothing. Well, let's just say that when I realized that 50 of those books were either missing or damaged beyond further use, I became a lot less liberal about loaning my books out. I changed my policy and told students that they were allowed to take out books from my classroom library but they were no longer allowed to take them home. Of course, when I told my students who were really interested in the books they were reading that they couldn't take them home, I could barely stand to look at their adorable sad little faces. So...I gave in. Well, I kinda gave in. I decided to create a separate "going home" log where students would sign out books that they were taking home overnight. The catch was that they have to bring the book back to me each morning so that I can be sure that it is being well taken care of. If it wasn't, they would lose their "take a book home" privilege. This worked pretty well last year and I had far less books damaged than ever before. I felt great because students were excited to borrow and read my books and my collection wasn't getting damaged. They come in packs of 2 for $1.00! There are a variety of colors. I bought these two sets. After purchasing them, I brought them to work and took out my favorite puffy paint. I put cute sayings on the bags that I thought would appeal to both my male and female students (not too girly). 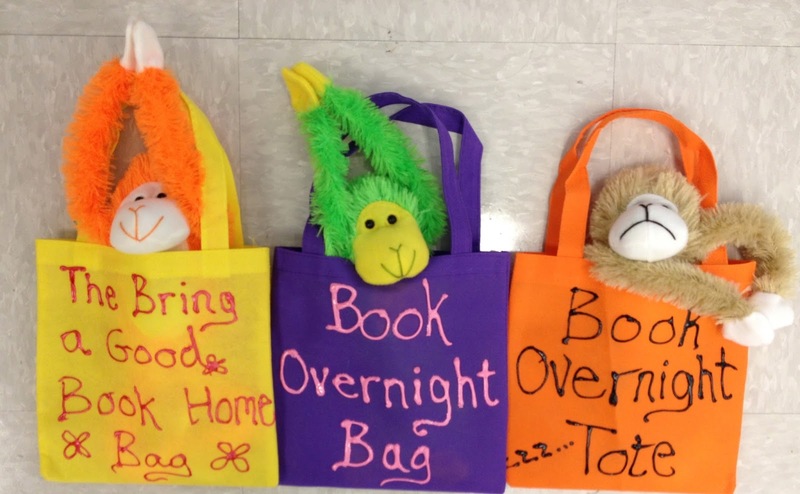 Then, I decided that the bags needed a buddy to travel with the book and go home with the student. Hi ho, Hi ho, it's back to The Dollar Tree I go! Once there, I find the cutest little stuffed monkeys with velcro on their paws. I scoop up four of them and head back to the classroom. 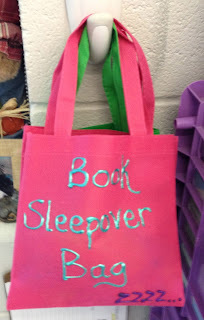 On the first day, I'm not sure how students will react to the idea of this little "Book Sleepover Bag". I tell students about it, but I can't tell if they are excited or not. So I open our classroom library and let them begin to take out books to have at their desk. I remind them that if they want to take the book home they will need to sign a separate sign out sheet at my desk. Students start to line up at my desk. Each one asks for a bag. Keep in mind that there are only four bags. All of a sudden, I have a line of 8 students and 4 are really disappointed to not get the bags. I'm making a mental note to get more but I am also doing the Snoopy dance in my head because my little idea is such a huge hit! Woohoo for Dollar Store ideas! Needless to say, I did go back and get more and we now have a collection of 10 bags and monkeys that are still in high demand! I've wiped out all of the monkeys from my local Dollar Tree before my secret gets out and other teachers in my school want to try it out too! 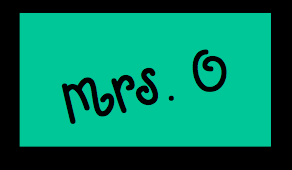 Because really, how can I not tell them about this little Dollar Tree idea that I had that became such a big hit in my 5th grade classroom? 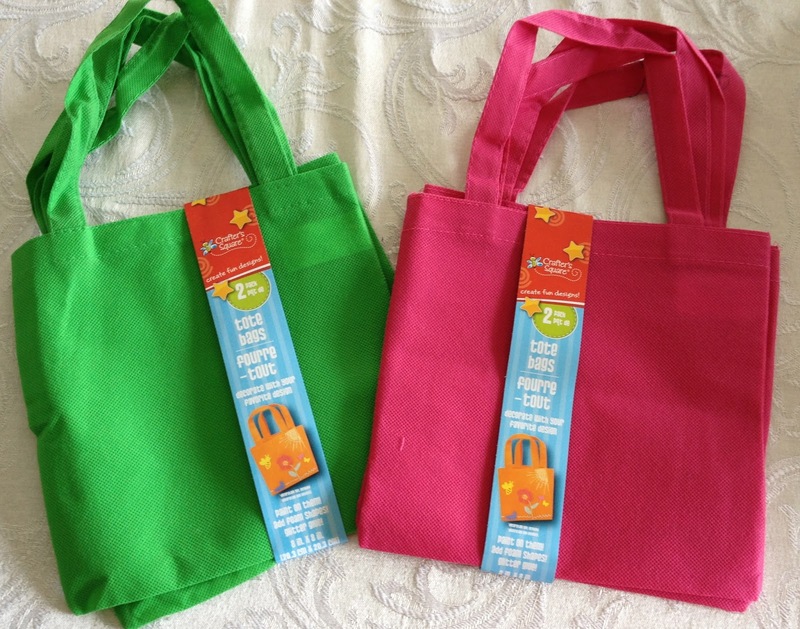 Who would've thought that these cute little bags would be in such high demand?